In December of 1844, a man wheeled a wagon across the fourteen cold and muddy miles from Manchester to Rochdale, England. Inside the wagon were a few pounds each of butter and sugar, six sacks of flour, one sack of oatmeal, and twenty-four candles. Those few bags of flour and oatmeal were the first products sold by the Rochdale Society of Equitable Pioneers’ Cooperative Store, and marked the beginning of the cooperative movement as we know it. People throughout the world have worked together cooperatively since before we invented writing. But the modern cooperative movement – with its focus on democratic control and members’ economic participation – grew specifically from the resistance of working people to capitalism and the industrial revolution. This is the story of how we went from a few pounds of butter and sugar to a worldwide movement that gains momentum by the day. However, by the 1840s – called “the hungry forties” in Britain – this first flowering of cooperatives had wilted; only a few of the 100 cooperatives were still functioning. It was the tail-end of the industrial revolution, when low wages and failed strikes left many workers unemployed. Those lucky enough to have a job were sometimes paid in “tokens” that could only be spent at the company store, leading to debt and servitude. High prices, adulterated food (for instance, flour cut with chalk) and outright cheating (by fixing weights and measures) were widespread. In this atmosphere, a small group of weavers and other textile workers with little money and less power came together to create the Rochdale Society for Equitable Pioneers. 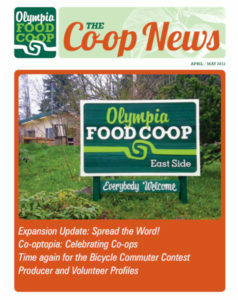 They “decided to make a stand against the capitalist ideologies of the Industrial Revolution and set about writing down a list of rules by which they would run their new society.” These principles formed the basis of the modern cooperative movement, and a modified version is used by cooperatives around the world today (including your Olympia Food Co-op). These principles are: voluntary and open membership; democratic member control; members’ economic participation; autonomy and independence; education, training and information; cooperation among cooperatives; and concern for community. In short, their cooperative, and those of us who came after, aim to return control of businesses to members and workers, with a broad focus on education and community well being. When you pay your Co-op dues, vote for the Board of directors, purchase quality food at a minimal mark up, or attend a Co-op class, you are following in the footsteps of the Rochdale Pioneers – along with millions other co-op members worldwide, at their local cooperatives. But back to the story: Taking Dr. William King’s advice about opening a store, the Rochdale Pioneers gathered capital of ₤1 per person, for a total of ₤28, in order to open a store where they would sell “honest food at honest prices”. On December 21st, at 8pm (because factory employees worked long hours), they opened their shop. It was staffed by volunteers, and because the gas company had refused them service (on the grounds that they didn’t believe the cooperative would be able to pay its bills), they had to use the candles to light their shop. The Rochdale Society proved the gas company wrong in short order. Within a few months, they added tea and tobacco to their shelves, followed later by the opening of a cooperative textile mill and factory. By 1854, the British co-operative movement had taken up the Rochdale Principles and over 1,000 such stores were open. The Cooperative movement founded on the Rochdale Principles has continued to grow. Over 29,000 cooperatives employ two million people in the United States alone, while more than a billion people worldwide are cooperative members. Today, after the failure of banks and the collapse of countries, when increasing income inequality can no longer be ignored, it’s important to remember that these same pressures led to the formation of the Rochdale Society, and to the principles upon which modern co-ops are founded. Cooperatives are businesses run by the people, for the people, whose focus is on the strength of the community rather than the price of a share. And that’s an idea whose time has come – again.